The preliminary rate of fatal work injuries in 2011 was 3.5 fatal work injuries per 100,000 full-time equivalent workers, down from the 2010 final rate of 3.6. More fatal work injuries resulted from transportation incidents than from any other event. Roadway incidents alone accounted for nearly one out of every four fatal work injuries in 2011.
where height of fall was known, 57 percent involved falls of 20 feet or less. Transportation incidents accounted for nearly three out of five workers killed in multiple-fatality events. Homicides accounted for the second greatest number of workers lost in multiple-fatality incidents. A disproportionate share of fatal work injuries involved men relative to their hours worked in 2011. A higher percentage of fatal work injuries involving women resulted from roadway incidents and homicides as compared to men. A higher percentage of fatal work injuries involving men resulted from contact with objects and equipment and exposure to harmful substances or environments. For women, assailants were most likely to be relatives. Of these, nearly all were spouses or domestic partners. Robbers were the most common type of work-related homicide assailant for men and the second-most common for women. Fatal work injuries involving Hispanic or Latino workers increased in 2011 after four consecutive years of decline. 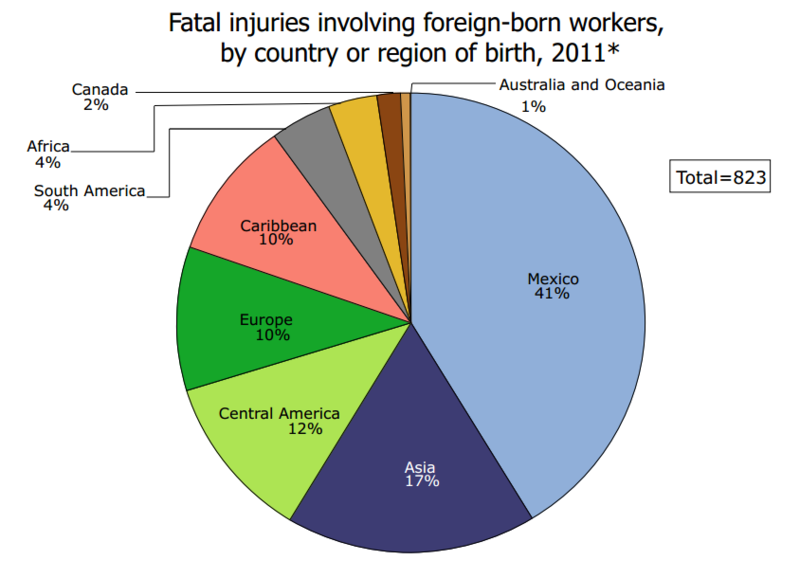 Sixty-nine percent of fatally-injured Hispanic or Latino workers in 2011 were born outside of the United States. 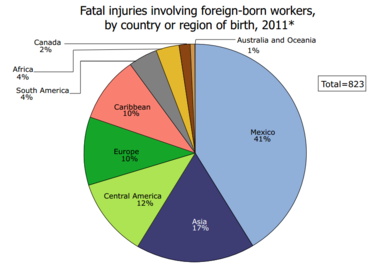 Workers born in Mexico accounted for the largest portion (41 percent) of foreign-born workers who died from work-related injuries in the United States in 2011. Fatal work injury rates for workers 45 years of age and older were higher than the overall U.S. rate, and the rate for workers 65 years of age and older was more than 3 times the rate for all workers. 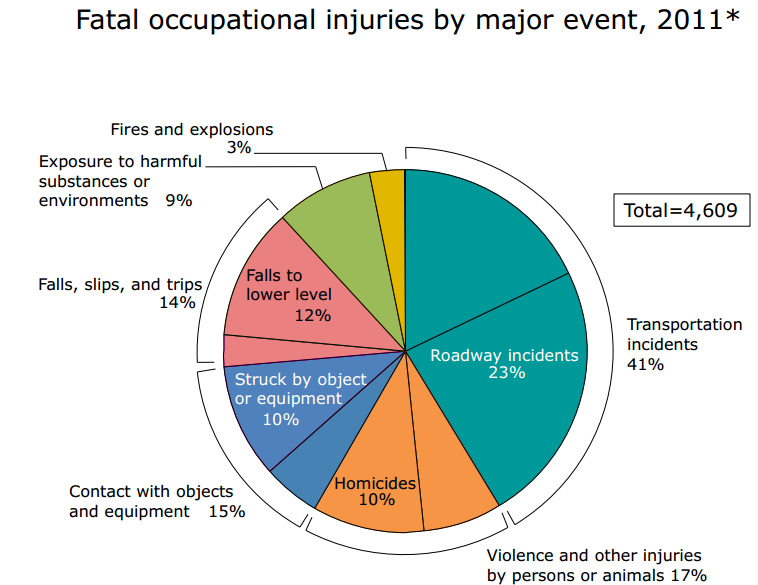 Transportation and warehousing surpassed construction in having the highest number of fatal injuries in 2011. The agriculture, forestry, fishing, and hunting sector had the highest fatal work injury rate. Fatal work injuries in the private mining industry decreased by 10 percent in 2011 after increasing the previous year from a series low in 2009. Fatalities in the oil and gas industry accounted for 71 percent of the fatal work injuries in the mining sector in 2011. 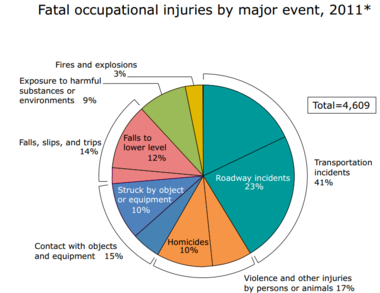 Although transportation and material moving occupations had the highest number of fatal work injuries in 2011, the major occupational group with the highest fatal work injury rate was farming, fishing, and forestry occupations. *Data for 2011 are preliminary. NOTE: Event data for 2011 are not comparable to prior years due to the implementation of the revised Occupational Injury and Illness Classification System (OIICS) 2.01. See http://www.bls.gov/iif/osh_notice11.htm. Percentages may not add to 100 due to rounding.